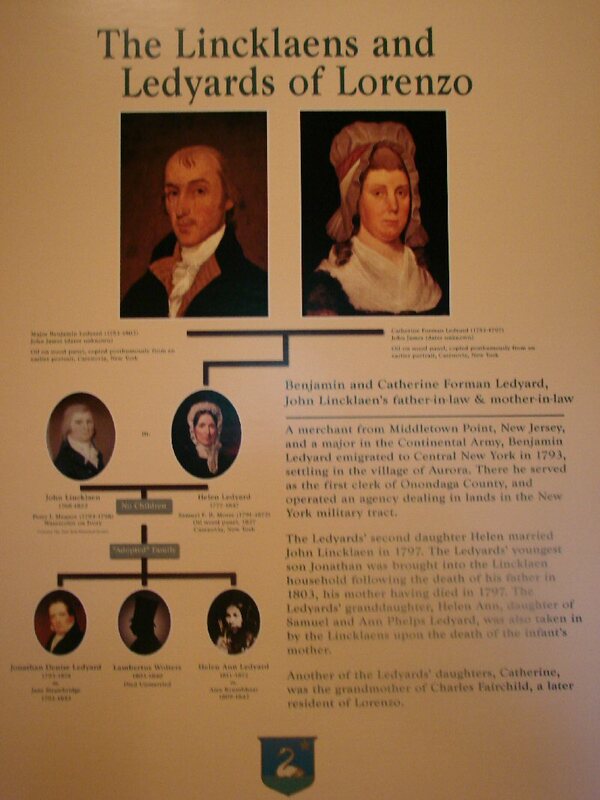 On a recent day trip, John and I visited Lorenzo, the home of John Lincklaen, the founder of Cazenovia. We had seen by the pretty home perched on the rise of land above beautiful Cazenovia Lake but this was our first visit and it turned out to be more extensive and interesting than expected. At the end of the Revolutionary War in1783 land speculators bought up large tracts of land in the western part of New York in the hopes of making a profit by subdividing and selling it to settlers who were anxious for inexpensive land suitable for farming. 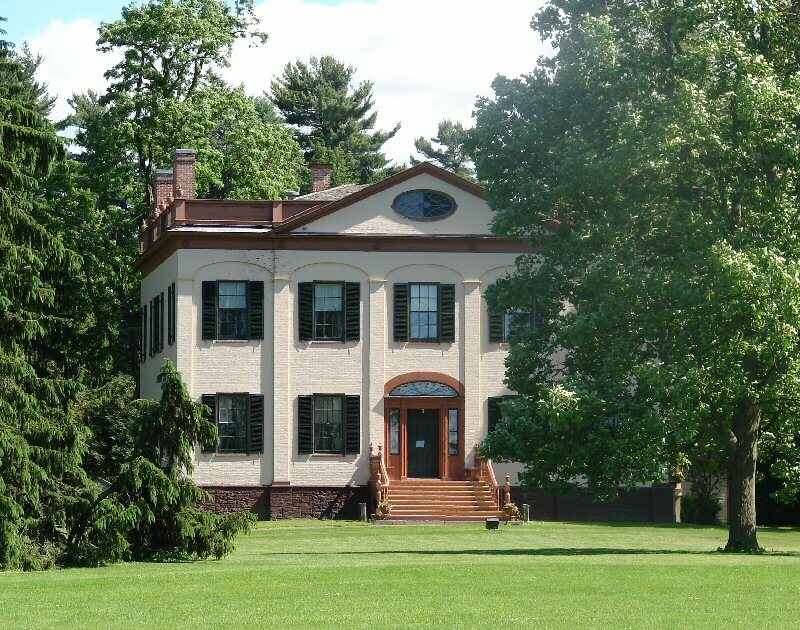 In 1792 Lincklaen, working for the Holland Land Company, checked out the area around the lake claiming, “…situation superb, fine land.” Settlers came and Cazenovia grew. 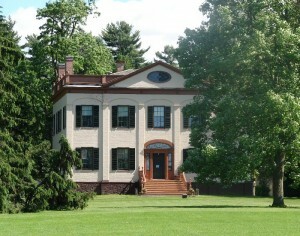 In 1807 Linckaen had his home, the neoclassic Lorenzo, built and the home stayed in the family until 1968 when it was sold to New York State. All the furnishings currently in the house belonged to the family. There are 56,000 items in the collection including landscapes by some of the Hudson River School painters. The Hudson River School was a mid-19th century art movement influenced by romanticism. Also, there are four family portraits by Samuel B. Morse. Morse is better known for developing the Morse Code and inventing the American version of the telegraph system but his first calling was that of an artist. Through the years the family’s friends included many important figures who visited the house including President Grover Cleveland. The house was perfect for a receiving line to greet the president. They entered the front door, greeted the president, and exited the door at the end of the hall. The furnishings represent the 1900s and there are many interesting items in the house. I always find something new to see and learn. At the finial of the newel post take note of the white glass button with a blue eye. It is called a ‘Mortgage Eye” and was an indication that the mortgage was paid off. While there was no mortgage to pay off, the lady of the house liked the concept so had it added along with the hollow newel into which it was customary to place the document indicating the mortgage was paid off. The servant’s quarters are just as interesting as the house. The wall-mounted call buttons are on the wall in the kitchen indicating which room the servant should check on. The Lincklean were given two slaves as wedding presents and later the family was served by an indentured family whose descendants still live in the area. At one time the grounds comprised of 1,000 acres but now it is only 89 acres. Notice what is called the ‘Ha Ha” fence on the edge of the property by the main road built so that it does not hinder the view of the lake. As one exits the house at the end of the tour there is an amazing locust tree planted in 1819. 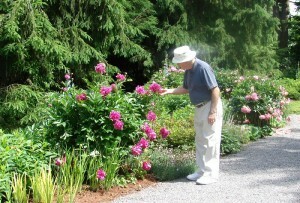 The gardens are lovely in the summertime and well-maintained. Take note of the Appleton Playhouse, the horse watering trough, and take a walk in the woods through the Dark Aisle. The Carriage House Museum is home to a variety of carriages and displays that add to the information about the house and times from 1807 to 1968. Mexico resident Sandra Scott and her husband, John, enjoy traveling and sharing that experience with others. She also writes everyday for Examiner.com (rotating on editions … Syracuse Travel, National Destination and Culinary Travel).